Authenticity & charm abound in this spacious S CA hacienda. Adjacent to the Morgan Run golf/tennis resort this Holcomb remodel features Saltillo tile floors, 4 sets of french doors opening to both an interior courtyard & large back patio perfect for entertaining or peaceful relaxation. Spacious master retreat w balcony overlooking pool, hills & golf course, guest bedroom & office w full guest bath, spacious kitchen w granite counters & SS appliances, open family room w fireplace & formal dining room., The perfect hacienda style home for the discerning buyer wanting the prestigious Rancho Santa Fe area coupled with the amenities of the Morgan Run resort featuring an 18 hole golf course, 9 tennis courts, a recently renovated clubhouse with spa, olympic size pool, resort pool, well appointed gym, restaurant & boutique hotel perfect for out of town family or guests. Convenient location close to beaches, I-5 access, downtown & airport only 25 minutes away. This property also makes a wonderful second home or vacation retreat. Lovely & authentic floorpan with so many touches like real wood french doors & windows, wrought iron balconies, spanish tile in baths, Saltillo tile floors, well appointed kitchen with all appliances including washer/dryer, lovely breakfast nook with french doors opening into your private interior courtyard as well as gorgeous flagstone patios both in the front courtyard with your built-in BBQ area as well as a back patio large enough for an outdoor dining table plus a nice lounge area to read, have your morning coffee or evening cocktail. Steps away from both community pool areas where you can get some exercise or simply enjoy your neighbors. 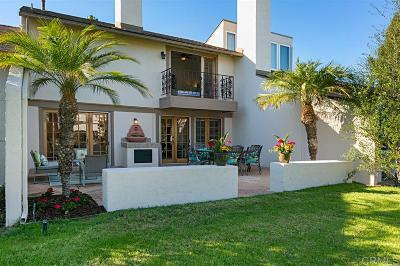 137 Via Coronado is a MUST SEE for anybody desiring a peaceful yet active southern California lifestyle!